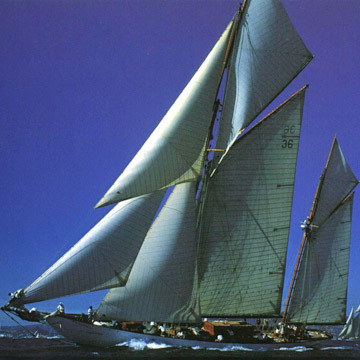 Until 1950 this ketch was property of its original owner, the Scottish Arthur Young. That period was just interrupted during the war, when the yacht became a school-ship. Before the conflict the Thendara sailed the Baltic Sea with Olaf, prince of Norway, on board as a guest. After that the yacht won another Marconi’s rig and spent some time in Greece and Italy. In that last one was exhaustively restored at Valdettaro’s shipyard in La Spezia, between 1996 and 1998. Nevertheless, the restoration project that make the Thendara keep on sailing until nowadays was done in 1994 at the Southampton’s Yacht Services shipyard in England. That was when the rig was restored. The Thendara is a typical composed construction, which has a teak’s wood cover on the ribs and some steel beams.